You can create an invoice from any section of the system. Way 1. The fastest one. At the top panel, click on the "+" sign and select the "Create invoice" option in the drop-down list. Way 2. In the «Finance» app. 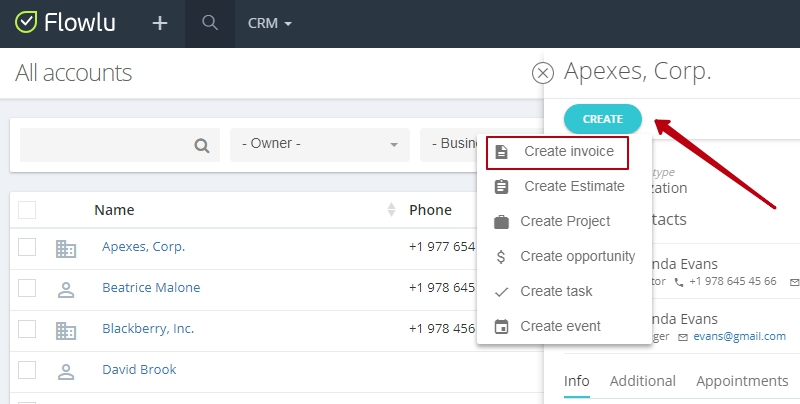 Go to Finance section → Invoice List and click on the Create Invoice button. Click on the title of Transaction, Account (company or contact) or Project and in the opened side-panel click on the Create button. 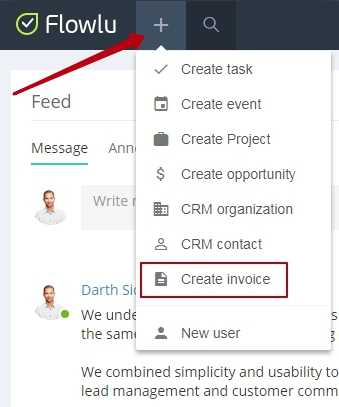 In the drop-down list, select Create invoice option. You can convert any estimate into the invoice. All information from the estimate will be automatically generated in the invoice.